Second cohort of the ADP trainees during ESMO 2018. Patient input into medical research is becoming increasingly important. 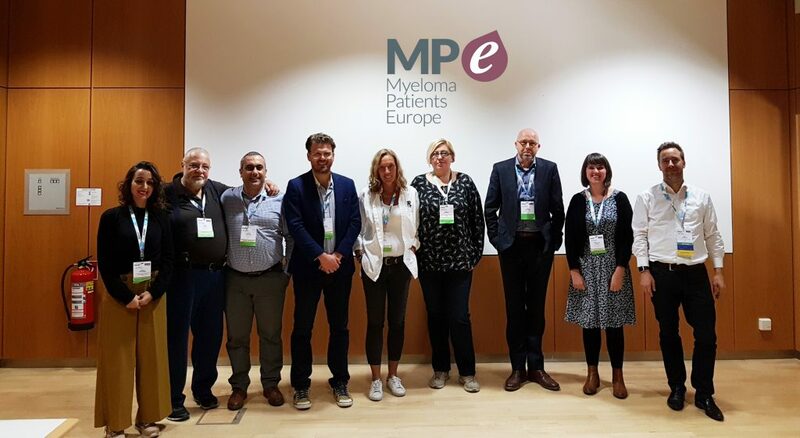 The MPE Advocate Development Programme aims to help myeloma and AL amyloidosis advocates understand the research and development process of drugs, from the preclinical stages through to post-marketing surveillance and national access. Topics include clinical trial design, regulation, pricing and health technology assessment (HTA). The programme combines a series of theoretical sessions delivered by experts with practical sessions that take place during the most important myeloma scientific meetings in Europe such as the European Haematology Association (EHA) Annual Meeting or the European Society of Medical Oncology (ESMO) Annual Meeting. This 12-month course aims to develop your capacity to become an even more effective and empowered patient advocate that serves patients in your community by understanding clinical research and development, mechanisms of accessing diagnostics and drugs, interaction with stakeholders like clinicians and industry, and the basics of evidence-based advocacy. The 2019 ADP class will have 5 seats. It will be required to apply for the patient scholarship programmes of EHA and ESMO provided to patient advocates to guarantee the access to both congresses. EHA provides 50 patient fellowships for their annual congress and it is required all EHA Fellowship receivers to attend the EHA / EuroBloodNet Patient Advocates Capacity Building Session. Participation in the training session is mandatory to all EHA Fellows, and not participating there will actually make getting future EHA Fellowships unlikely. The ADP welcomes patient advocates with any kind of professional background. However, healthcare professionals who are actively practising their medical profession e.g. as a haematologist or nurse in a clinic are not entitled to apply for this programme. If you are willing to become involved in the MPE Advocate Development Programme in 2019, please fill in the formin the link below until 25 March 2019.